Are you an experienced manager, trainer or consultant who wants to add Executive Coaching to your skill set? As an experienced professional who draws out the ability of others, you may have learned that you have an aptitude for coaching and would like to develop those skills further. 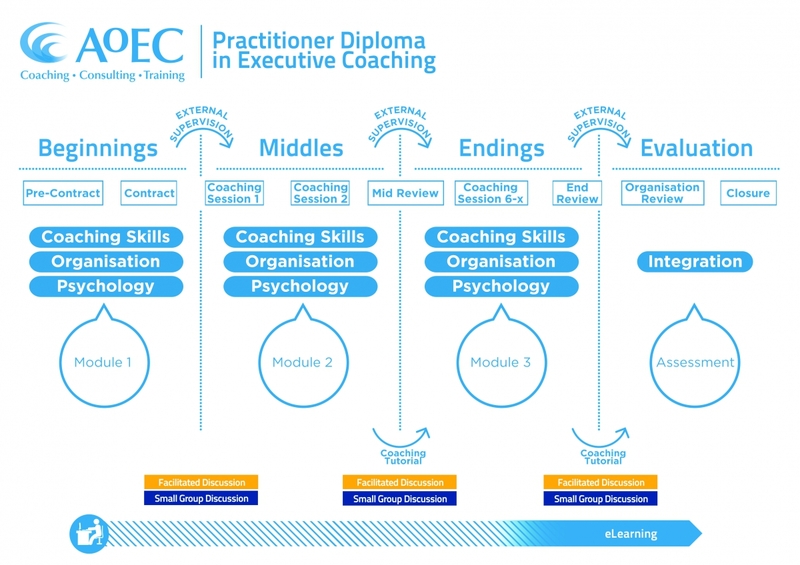 Perhaps you want to complement your HR or OD function by extending your coaching skills. Or, you may be a life coach who wants to learn more about how to coach executives. If any of these statements is true, then the Practitioner Diploma is for you! Develop a clearer understanding of contracting with client, coach and sponsor. Study key coaching frameworks and models to clarify goals and objectives. Enhance your listening and questioning skills in practice sessions with direct feedback. Start to develop your own personal, unique coaching framework. Clarify your understanding of ethical guidelines and professional standards. Establish peer coaching relationships to promote coaching practice. Learn how to utilise consulting skills in a coaching context. Utilise systems thinking as a means to understand the client’s world. Assess your client’s developmental and emotional needs. Clarify the boundaries of your personal coaching practice. Explore the nature of personal and professional change. Be alert to both explicit and tacit information and its impact on coaching outcomes. Perform mid-term reviews with client and sponsor. Employ solutions-focussed coaching tools to achieve client outcomes. Manage the ‘psychology of endings’ providing healthy closure for client, coach and sponsor. Completion of the three modules + assessment day in sequence on a single program. Two individual coaching tutorials over the course to embed your personal learning. Participation in 6 group discussions (3 tutor lead) by webinar after each of the 3 modules to deepen your understanding. Completion of the online program to support and develop your learning further. To have a minimum of 2 practice clients for the duration of the program. Successful participation in and completion of the work for the Live Action Coaching Day. Presentation of your unique and developing Coaching Framework and Model. Reflective essay on your personal learning journey. Live demonstration of your coaching. As a continuum of your learning, we offer a limited number of discounted places on the Advanced Practitioner Diploma program to our Practitioner Graduates, subject to the application criteria being met. This takes the form of a thorough coaching competency assessment leading to a robust learning plan. Substantial people development, experience in management, training, counselling or consulting. Please fill in the form to register for this course and a member of our team will be in touch with the next steps. “For me it is an amazing experience to learn a set of skills, but not be told it’s formulaic. You are not told you’ve got to do it this way, you learn different tools and techniques, but at the end of it you are asked to have your own coaching model, that for me is the bit I love about the course the AoEC has. It gives you a bit of freedom in how you approach coaching post the qualification. The other big thing is that it didn’t feel like I was just going along and I just had to attend every session and then I’d be certified. It really made me work, and work really hard to achieve the certification, so when I got the email to say I’d passed and I was successful, I really believed that I’d deserved that. I think it was a great seven days, I’d have loved it to have been 14 days. Philip Atkinson, Communications Director, Roche, Basel, Switzerland.